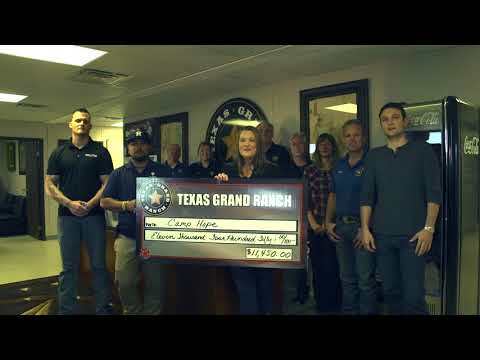 Texas Grand Ranch celebrates the holidays by giving back. WALKER COUNTY, Texas, Dec. 4, 2017 /PRNewswire/ -- Texas Grand Ranch has a lot to be thankful for this holiday season, and they want to give back. This exceedingly popular Patten Companies acreage community located north of The Woodlands, has partnered with Michael Berry, Houston radio personality, in support of the PTSD Foundation of America's Camp Hope, which provides a safe haven for veterans and their families to find help and healing when enduring the effects of Post-Traumatic Stress. Texas Grand Ranch has a lot to be thankful for this holiday season, and they want to give back. Now through December 17, Texas Grand Ranch invites you to see the special selection of 2 to 5 acre homesites priced from $59,900, and they'll make a significant donation – a minimum of $100 – to Camp Hope in honor of you or a loved one, just for visiting the property. Gary Sumner of Patten Companies explains, "Michael Berry introduced us to the inspiring men and women of Camp Hope last year. Ever since then, a piece of our heart has been with them, and we want to continue to show them our support and gratitude." In September 2016, during their Homesites Helping Heroes, Land Sale for a Cause, Texas Grand Ranch, along with contributions from donors and sponsors, raised a total of $81,664 for two Veteran-focused charities, PTSD Foundation of America's Camp Hope, supported by Michael Berry, and Marcus Luttrell's Lone Survivor Foundation. During their one year anniversary of Homesites Helping Heroes last month, Texas Grand Ranch residents and sponsors raised another $11,500 for Camp Hope. "It's fun to talk to listeners of mine, who've purchased at Texas Grand Ranch, this is where they're going to live their lives, and they are prouder today than the day they made that decision to buy. Because it's not just a development, it's a place with shared values. And the commitment of Patten Companies to a cause that's near and dear to my heart, and to see that they're committed to our Veterans, that they're committed to the community. Patten Companies is doing a great job," says Michael Berry. After hearing the Hope for the Holidays announcement, David Maulsby - Director of Camp Hope, expressed his gratitude. "Thank you for the continued support of Camp Hope. Grateful to see this after receiving $11,500 from Texas Grand Ranch!" For more information on the one year anniversary of Homesites Helping Heroes, visit https://www.txgrandranch.com/land-for-sale-in-texas/. For more information and directions to Texas Grand Ranch, visit https://www.txgrandranch.com/hope-for-the-holidays/ or call (888) 473-5175.